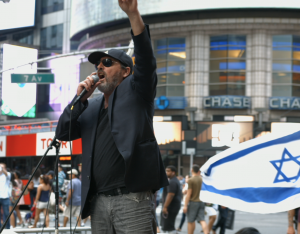 As the difficult situation continues in the Middle East and critics worldwide blast Israel for its response to Hamas rocket fire, comes Shmor, an all new music video starring Israeli superstar Benny Elbaz, set against the backdrop of the Midtown Manhattan pro-Israel rally that took place on July 21st, 2014 and was attended by thousands. With mesmerizing footage showing the unbreakable link between the nation of Israel and its unbreakable commitment to our Heavenly Father as well as the solidarity between the Jewish people, both religious and secular, Shmor is a musical affirmation of the unshakeable belief that even in moments of crisis, we know that both Israel and the Jewish nation are divinely protected. An original composition by Cecelia Margules, arranged by Eli Lishinsky, Shmor soars to the highest heights and is a Sparks Next production produced by Danny Finkelman.